When life gives you sharks, you swim as fast as you can and take a selfie. It hit us today that some of the things we did today were among the last things we will do. We gave our last taxonimic briefings and made our last poster. Although it is surely sad, we did contribute to our island in a real way. We picked up trash that has been washed up on Middle Caye, on two sides of the island, one windard and the other leeward. Yesterday, we learned that humans have contributed immensely to the amount and type of debris in the ocean. Depending on the trash (whether it is very or not very transportable, bouyant, and degradible), it can have variable amount of presence on our environment. Plastic like size of a shoebox, for example, can be broken up to millions of smaller pieces, called microplastics. Their degrability is extremely low and can last for thousands of years. We set out to see what kind of trash we will find on the island and found that the leeward side of the island received more individual pieces of trash and more kinds of trash, including cloth, metal, and paper. However, the windward side received less of the more transportable debris like hard plastic and styrofoam. The transportability differential likely contributes to the leeward side’s receiving more pieces and more kinds of trash because easily transported trash are more likely to end up in areas that do not receive as much wave energy and hence have a higher chance of being stuck there. After trash collection, we went out to a portion of the reef inside the atoll called “the aquarium” due to its abundance and diversity of marine life. Huge mounds of coral and human size sharks are found here, and when we found nurse sharks, we all kicked our fins as hard as we could toward the shark. Don’t worry, if you are worried, because nurse sharks are not known to be actively aggressive to humans. Their main response to humans is to flee, if they notice close human presence. In other news, we tracked down schools of blue, silver fish as they travel through and sometimes knock themselves into coral. Our excited tracking of the fish caused the fish to swim fastly before us, as if we were herding them. When surprised of our presence, some reacted by fleeing so quickly that they scraped against coral rubble in the process, with their collision audible to us. Another unexpected encounter was when I observed a large fat parrot fish eat a handful of the wrinkled brown algae. It was so disproportionally big to the fish that I laughed out loud underwater. Fortunately, this reef was covered in this type of brown algae, in addition to a lot of crustose coralline algae and blistered saucer-leaf algae. A lot of y-branched red algae also grew on other types of algae, which often grew on limestone deposited by corals. Life on life on life has been a big theme of this trip and it has really come to a culmination in today’s trip to reefs and channels in the atoll. 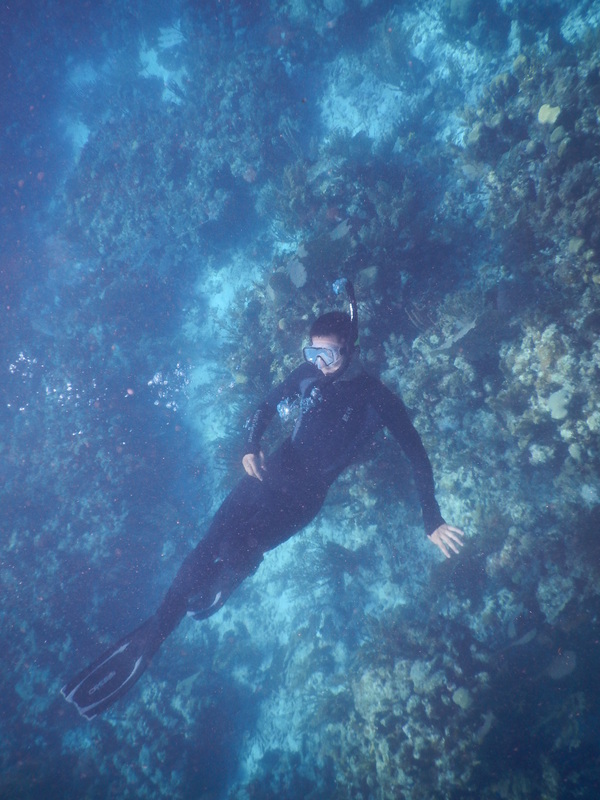 The geography of the water also lent very well to my practicing diving to the benthos, and I am very happy to say I am not only comfortable in the water, but extremely fond of being in the water, and not to mention swimming with sharks. That is one thing I owe to this place, my new relationship to water, going from barely able to swim to doing all sorts of tricks 15-20 feet underwater all the while avoiding the burning fire coral. Shout out to my swim instructor Mahdi!